Use these metrics to monitor and improve the performance of your sales reps in real-time. If you are solely measuring your sales reps based on number of opportunities created or deals closed, you stand little chance in helping them improve. Sure, that is the end product you want from your sales team. But unfortunately, when you need to give feedback to reps and share best practices with the whole team, these metrics will not help you. The rep will certainly have an anecdote or two on things that went well, but that is just their guess. You don’t want to start changing best practices for the entire team based on a collection of anecdotes. You need real data that backs up these stories. In simpler times, when Customer Relationship Management Systems (CRMs) tracked only basic data points, you would be forced to rely on these anecdotes, listening to recorded calls or doing ride-alongs. But now, with increased functionality of CRMs and more sales technology than ever, you can collect 5-10 data points on every call to get real data on what tactics lead to opportunities and closes. You can identify the exact parts of the script or answers to common questions that lead to “yes”. So, here are ways that veteran sales leaders use call data to understand the factors that lead specific sales reps to exceed their quota. The ratio of call connects to opportunities is not enough for getting to the root of problems. Instead, you can use conversion-based measurements between every step of the process to see where prospects might be losing interest. How I Measure Prospecting: First of all, it’s important to note that we don’t believe in forcing reps to read off hard and fast scripts. We have some generic talk tracks for reps to use, but in the end, we encourage them to improvise and make each conversation unique. Because of that, the best way to measure the “effectiveness” of our base script is comfort, or how easily the rep can adapt what’s on paper into a real conversation. We see comfort reflected in metrics like talk time, pipeline health, number of opportunities, etc…the more they can expound upon the base script the better. How I Collect Feedback From Reps: We collect feedback daily – if the reps feel like their calls follow the same starting pattern and it’s not reflected on the script, we change them. We also don’t “gate” our scripts – each rep has a copy and they’re able to make changes to it on the fly. We’ll meet once a week to discuss how things are going and if there needs to be any drastic changes made, but for the most part they have control over what they put on paper (and what they say live on the phone, of course). After hundreds (or thousands) of calls, you are going to want to know which answers get prospects interested enough to book a demo. You may have a few hypotheses in your head, but if your salespeople fill out their notes diligently, you can use a rich data set to learn what is going on in prospects’ heads when they are being pitched. Did you know that you can find the exact point in the call when the prospect either loses interest or understands the value proposition? If you are cold-calling, and the prospect does not know who you are, you are likely facing an uphill battle. So, you can measure whether your reps make the prospect feel comfortable on the phone, and whether they are listening when you give your 30-send intro. How I Measure Prospecting: “We use phone data to check conversations / connects. An outbound conversation is over 2:30 and a connect is typically under 1:30 (as is a typical voicemail). Also, we look for average talk time to increase as well as talk time/call. How I Measure Prospecting: “By tracking call connections, disposition, length and outcome we can understand how effective our calls are once we get someone on the line. While working in a small team it is easy to get a sense of if our talking points are resonating or not. If you want to see trends in sales rep data on a daily basis, you can’t wait for the big weekly or monthly report. You can use a free Sales Rep Performance dashboard to keep track of the whole sales team at once. This will help prevent high-pressure meetings, and keep the whole team on track to meet the monthly quota. 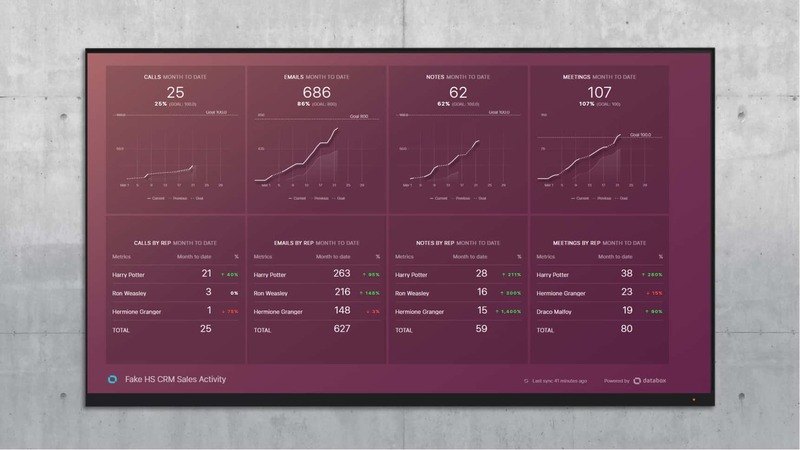 Also, since salespeople are usually pretty competitive, you can put the live dashboard on a TV in the office so your salespeople can see the stats of top performers. Also, if you have different KPIs for different team members, or a total number that the sales team needs to hit, you can track progress to goals in real-time as well, as long as you use HubSpot, SalesForce or Pipedrive. With software today, sales management can inspect, monitor conversion rates and coach more efficiently than ever. The best sales management teams are using technology and data to help their team improve. PS. Need help increasing your sales team’s activity? Here’s tips for increasing sales activity from 18 experts.